We design and build custom hardware as required to support our automation applications or on a contract basis. Our designs have covered a wide range of embedded applications, from controlling dental chairs, commercial money vending safes, controlling solar troughs, energy measurement meters, LED Road Signs, Flight Simulators to weighing chickens. The majority of designs incorporate microprocessors, our favourite being the Atmel AVR series. (We also represent the E-Lab Computers range of AVR Pascal and programmers .) 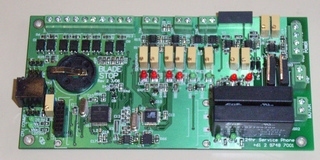 For non embedded systems, please refer to our Automation Applications page. Most designs have a combination of various comms interfaces, such as serial (RS232 and RS485), USB and Ethernet and of course there are interfaces to other peripherals, such as LCDs, lamps, switches and sensors. We have also developed specialised modems for Telstra and other specialised hardware. We can build small protoype runs or arrange full manufacturing services. We also offer PCB design (PCB Layout) services if you already have the circuit design. If you have a concept, give us a call to turn it into reality! For more complex hardware projects we collaborate with Les Grant of Grantronics Pty Ltd , with whom we have had a long and successful association.